On Friday, February 9, our Br. 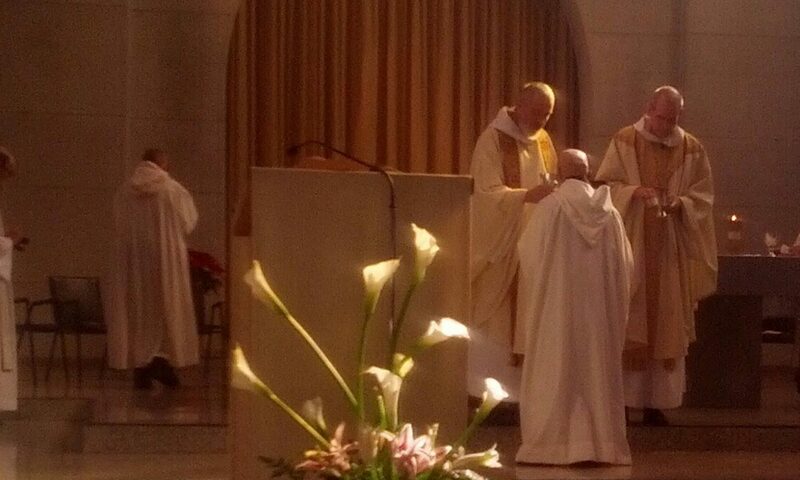 Nathanael Felarca made his solemn profession in our Abbey Church. His six sisters and several brothers-in-law joined our monastic community and local friends for this special event. Our community drew close to his sisters when they came to visit several years ago when Br. Nathanael was hospitalized after contracting Rocky Mountain spotted fever from a tick bite. He was in a coma for several weeks, receiving blood transfusions while his body healed. His sisters came in various combinations so that some were always with him. After his solemn profession, his sisters treated the monastic community to a plentiful Filipino feast. We all had a joyous time. Snow fell in Georgia last night. On our way to Vigils at 4:00 we could see the cloister garden was white with snow. Later in the day, the four juniors (monks who have made vows for a limited time) and the junior director went out to the cloister to take pictures in the snow. Several of our juniors will be making their solemn profession in the course of this year. In the picture you can see, from left to right, Br. Philip, Br. Miguel, Br. Cassian (junior director), Br. Emilio Rafael, and Br. Nathanael. Br. Nathanael will making his solemn profession on Friday, February 9. Our monks and nuns who have made simple vows (vows for a limited time) gather each year for a seminar. This is a great opportunity for monks and nuns from across the USA to get to know each other. Because we are cloistered (living within the boundaries of the monastery) we have few opportunities to travel. This is one time that we travel to another monastery. In this picture, on the left is Fr. Gerard-Jonas, a monk of Mepkin. In the center is Sr. Mary Thérèse, a sister from Our Lady of the Mississippi. Br. Emilio Rafael, who is second from the left, and Br. Philip, on the right, are both monks of Our Lady of the Holy Spirit. Pope Francis currently lives in Rome. We are beginning to design a page for men who are interested in exploring life in our monastery, the Abbey of Our Lady of the Holy Spirit, in Conyers, Georgia.